The Trojan War was a great military adventure of ancient times, undertaken by the kings of ancient Greece against the city of Troy. It lasted for ten years and cost many lives, but also produced many heroes. The last battles of the war were beautifully described by the great poet Homer in his epic poem "The Iliad". It was called like that, because the ancient name of Troy was Ilion. In the myths surrounding the Trojan War, fact is indeed mixed with fiction, as archaeological excavations bear evidence that really such an expedition took place in ancient times. According to Homer, the apparent cause of the war was the abduction of beautiful Helen, wife of King Menelaus of Sparta, by Paris, a prince of Troy, while he was a guest staying at the palace in Sparta. The real reason, however, behind the conquest of Troy by the Greeks, was its strategic position on the Hellespont. According to another mythical version, the reason behind the Trojan War was founded on the belief of the ancient Greeks, that god Zeus arranged the whole thing, because he was convinced that such a war which would cause many deaths, would be the right solution for the problem of overcrowding, which plagued the earth at the time! The events that led to the Trojan War began long before the war itself did. As a matter of fact, all started at the celebrated wedding of Peleus and Thetis, who would later become the parents of hero Achilles. As the myth goes, the goddess Eris, enraged for not being invited to the wedding, decided to toss a Golden Apple, inscribed "For the Fairest", among the goddesses. Immediately, Hera, Athena and Aphrodite started to fight over the apple. To put an end to the incident, god Zeus ordered the three goddesses to take their quarrel elsewhere and instructed Hermes to lead them to Troy, a great walled city on the Aegean coast of Asia Minor. 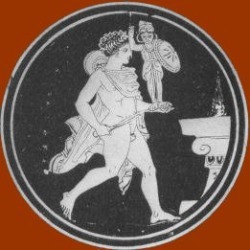 Furthermore, Zeus appointed Paris, a Trojan prince and reputedly the handsomest of all men, to be the judge who would decide which of the three competitors was to win the controversial trophy. Aphrodite merely offered the most beautiful woman in the world: Helen, a daughter of Zeus and a sister of the Dioscuri, Castor and Polydeuces. Paris did not hesitate for a moment, quickly accepting the offer made by the goddess of love. Claiming his "prize", was not an easy task for Paris. Helen at the time was married to Menelaus, king of Sparta and brother of the wealthy Agamemnon, king of Mycenae. Despite this fact and ignoring the warnings he received from his brother and sister Helenus and Cassandra who were seers (they had the capacity to foretell the future), Paris left for Sparta. Menelaus and Helen's brothers all welcomed him at their palace and entertained him for nine days. When the king left the palace to attend his grandfather's funeral, Paris seized the opportunity and left off for Troy, taking Helen with him. 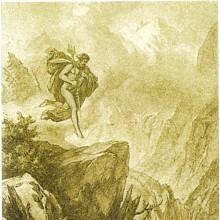 Myth tellers disagree on whether Helen followed the handsome prince on her own will, or whether she was taken by force. The playwright Eurypides went as far to contend that Helen never made it to Troy. 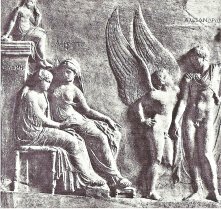 Hera, still bitter over being rejected by Paris, "spirited" Helen away to Egypt, putting a ghost in her place that she made up from a cloud. Thus, the Greeks and Trojans were engaged in the bloody Trojan War for 10 years, over nothing more than a cloud! Menelaus, being furious at Paris for what he had done, called on all the Greek kings to help him punish the Trojan. His campaign was successful: In a few months, a great army was gathered in Aulis, ready to set sail. Being the most powerful of all kings, Agamemnon, king of Mycenae and brother of Menelaus, took the position of Chief Commander. According to the second book of the Iliad, the whole Greek army consisted of 28 contingents which originated from all over Greece. The total contribution of ships amounted to around 1,200 and the head count of warriors was estimated to reach 130,000. Click here to see a detailed map of the locations of the Greek contingents. But, unfortunately, unfavorable winds kept the fleet from setting out for Troy. Calchas, the most renowned seer at the time, blamed the ill winds on Agamemnon, whose boastful claim that he could hunt better than goddess Artemis had offended her and thus punished the Greeks. In order to appease the angry goddess, the seer contended that Agamemnon should sacrifice on an altar, his beloved daughter Iphigenia. Despite the king's reservations, the girl was finally brought to Aulis by Odysseus and Diomedes, under the pretext of her marrying Achilles. At the time, however, that Iphigenia was placed on the altar ready to be sacrificed, a cloud descended and the girl was taken away by Artemis. 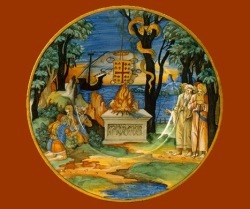 In her place, the goddess left a deer to be sacrificed. All the events taking place in Aulis are vividly described in Euripides's tragedy named Iphigenia in Tauris, in which it is claimed that the girl was rescued by Artemis and taken away to serve as her priestess in Tauris, the Crimean peninsula on the Black Sea. Once the winds changed, the fleet set out. However, since no one knew the way to Troy, the fleet landed to the south of the city, in Mysia. There, the local king Telephus, who was a son of Hercules and the son-in-law of Priam king of Troy, led an army that attacked and killed a lot of Greeks. When Achilles managed to wound him, Telephus consented to follow the Greeks back to Euboea where they originally set out from and then show them the way to Troy, on the condition that Achilles would cure him of his wound. His decision to follow the Greeks was based on old oracle which decreed that in case he was wounded, the only person who would be able to cure him would be his assailant himself, namely Achilles. 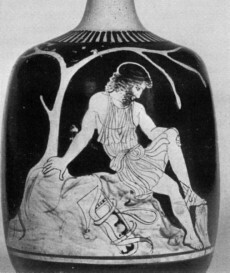 After getting underway again, Philoctetes - who as a boy had inherited Hercules's bow and arrows in return for lighting Hercules's funeral pyre, was bitten by a snake during a stopover at Lemnos (one of the Aegean islands). The stench of his wound and the sound of his agony were so unbearable, that his shipmates -urged by Odysseus - abandoned him there. Before the Greek army disembarked from the ships, Menelaus and Odysseus went to meet king Priam to seek a diplomatic settlement of the issue, in order to avoid military conflict. While the elderly king saw favorably the return of Helen and the spartan gold in order to avoid confrontation with the mighty Greeks on the battlefield, his 50 sons would not succumb to the threat of war, opting to stand by the side of their brother Paris. Having no other option, the Greeks decided to land and start the Trojan War. But, one serious complication prevented them from disembarking: An oracle had foretold that the first warrior to set foot on Trojan soil, would be the first casualty of the Trojan War. 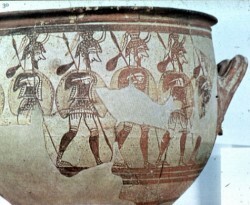 As a result, none of the Greek soldiers was willing to get off the ship and hit the soil of Troy. Cunning Odysseus, seeing the impetuous and brave Protesilaus eager to start fighting, gave the order to jump, while he in the meantime threw his shield on the ground and jumped, avoiding in this way to physically touch ground himself. Protesilaus followed suit, jumping onshore and throwing himself into the battle. To his great misfortune, however, Hector, prince of Troy and son of Priam, quickly spotted him, thrusting his sword against him and thus fatally wounding him. In this way, the prophecy was fulfilled, making Protesilaus the first Greek to die in the Trojan War. Rather than mount a direct attack on the formidable fortress of Troy, the Greeks chose instead to destroy the surrounding towns and cities which all belonged in the wider region of Phrygia. Troy depended on these settlements for its supply of provisions and aid. In the course of their campaign to isolate Troy, the Greeks committed many atrocities: Not only they looted the cities of everything they could get their hands on, but also raped and enslaved all the women. Zeus, Hades, Demeter and Hestia, remained neutral throughout the Trojan War. Furthemore, the Trojan War provided the opportunity to many warriors from both sides, to display their bravery and heroism. Achilles: He was undoubtedly and by far the greatest of all Greek warriors during the Trojan War. He killed countless Trojans and he proved to be irreplaceable on the battlefield. The Greeks felt his absence the most, when Agamemnon stole from him his concubine and thus decided to refrain from any activity on the field. Click here to learn more about Achilles. Hector: The eldest son of king Priam, Hector proved himself to be the mightiest of the Trojan warriors during the 10-year Trojan War. Noble and courageous, he proved his superior military ability on the battlefield. When the war escalated into dangerous proportions, he tried to convince his brother Paris to meet his adversary Menelaus on a one-to-one duel to settle the matter once and for all. However, when Paris finally challenged the Greek king, he abandoned the combat in the middle, guided by Aphrodite. Hector also killed Patroclus, a deed which in the end proved fatal for him. 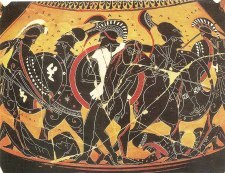 Achilles returned to the battle and killed the Trojan prince, bringing havoc to the Trojan army. After the Greeks returned Hector's body to the Trojans following the desperate pleas made by king Priam to Achilles, both sides called an 11-day truce in order to mourn the greatest of Trojan heroes. 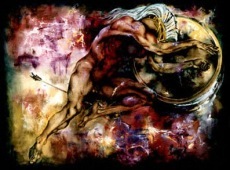 Diomedes: A hero of Argos, Diomedes was second only to Achilles among Greek warriors. In addition to killing many Trojans, the hero even wounded two gods: Aphrodite and Ares. In the case of Aphrodite, the goddess was involved in a combat taking place between Diomedes and the Trojan hero Aineias, who was the goddess's son. When, in the course of the battle, the Greek hero threw a rock at his opponent smashing his hip, Aphrodite took Aineias is her arms, in order to protect him. Then, enraged, the king of Argos drew his sword and slashed the goddess's arm. That was the first time that a mortal managed to inflict a wound on a god. Odysseus: The king of Ithaca was renowned for his cleverness, which he used not only for noble purposes, but also for his own benefit. For example, when he and Diomedes captured Dolon, a Trojan spying on the Greek camp, they forced him to reveal the layout of the Trojan camp. In addition, in order to convince the two Greeks to let him free, Dolon directed them to the place where Rheseus, king of Thrace, had camped outside the walls of Troy to spend the night. Rheseus was a friend of Hector and had come to Troy to assist his friend in the Trojan War. What was so special about this king which attracted the greed of cunning Odysseus, was the fact that Rhesus had in his possession 12 magnificent horses, which were very valuable. As soon as Diomedes and Odysseus disposed themselves of the Trojan spy, they attacked king Rhesus, killed all of his men and captured his beautiful horses. Ajax of Salamis: The son of Periboea and Telamon - the same one who had captured Troy with Hercules more than a generation earlier- Ajax was the tallest among the Greeks, an imposing figure on the battlefield. At one time during the Trojan War and to end the needless slaughter on both sides, the gods Athena and Apollo sent a mental message to the Trojan prince Hector, urging him to challenge one of the Greek warriors to an one-on-one combat. He who would emerge victorious, could claim his side to be the winner of the war. The Greek leaders drew lots among the heroes, and the lot fell to Ajax, who was to combat with Hector the following morning. The next morning, the two opponents fought until their spears broke and their shields were battered to bits, without either one of them clearly winning the other. At the end, they decided to declare the duel a draw, showing respect to each other by exchanging gifts: Ajax gave Hector his belt, while the Trojan gave him a sword. Ajax was destined to have a tragic end: After the funeral of Achilles, the Greek leaders were fighting over who would take into his possession the armor of the deceased hero. Following an advice by the wise king Nestor, they all agreed to draw lots. 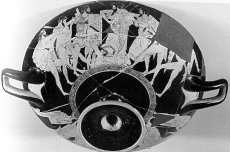 At the end, the trophy went to Odysseus, after the lots had been tampered with by goddess Athena. Ajax was very embittered, feeling that he was entitled to the armor, because he and Achilles were the only ones who had been able to have a one-to-one combat with Hector and were not defeated. Overwhelmed by madness, he slaughtered the Greeks' herds of livestock, illusioned that these were the Greek generals who had insulted him. When he finally came to his senses, he was so embarrassed that he resorted to committing suicide, by falling on his own sword. 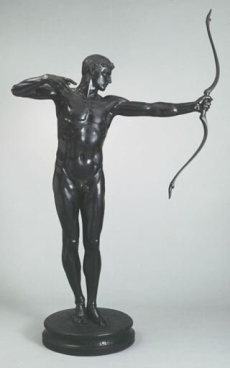 Teucer: Another son of Telamon (Hesione was his mother), Teucer was considered to be one of the best archers on the Greek side, second only to Philoctetes. He often fought from behind the shield of his half-brother Ajax. Aeneas: A Trojan prince, Aeneas was one of the bravest Trojan warriors. 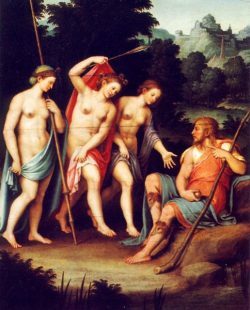 When he was wounded, his mother Aphrodite rescued him and Artemis and Leto healed him. Being one of the few fighters who survived the Trojan War, Aeneas led several other Trojans to a new home in Italy, where later the Romans claimed him as the ancestor of their first emperors. After nine long years, despite their victories in the surrounding area of Troy, the Greeks never came close to penetrating the colossal walls of Troy, which were built by gods Apollo and Poseidon. At the tenth year, the balance of the outcome of the Trojan War was apparently tipping in favor of the Trojans, thanks to the reinforcements they received from foreign lands. Two of the most well known army leaders who came to Troy's rescue, were the Amazon queen Penthesileia and Memnon, the king of Ethiopia. Both of them, managed to inflict great damages on the Greek army. Included among the victims of Memnon was Antilochus, the son of the wise king of Pylos, Nestor. However, in the end, the two leaders were destined to suffer a tragic end at the hands of Achilles. In the case of Memnon, the Ethiopian king was challenged to a duel from Nestor, who wanted to avenge his son's death. When his offer was declined by Memnon citing the advanced age of the Greek king, Achilles offered to take his place. Memnon accepted the challenge, but was later killed from the powerful Greek. The Trojans managed a severe blow on the Greeks when Paris, with the aid of god Apollo, killed mighty Achilles by shooting a poisoned arrow on his heel, which was the only mortal part on his body (click here for a detailed account of Achilles's life). Eventually, the Palladium, an ancient wooden statue of goddess Athena, should be captured from the Trojan citadel called the Pergamum. The mission to fulfill all those prerequisites to win the Trojan War, was undertaken by none others than Odysseus and Diomedes. They first sailed to the island of Scyrus, where they recruited young Neoptolemus. The young man was more than eager to engage in battle. On their way back, they made a stopover at the island of Lemnos to pick up Philoctetes. Despite his initial grudge on Odysseus who was the one responsible for his being deserted there, he was finally persuaded to join his visitors on their journey back to Troy, when the spirit of Hercules appeared before him, urging him to get involved in the Trojan War. When the four of them returned to Troy, they were happy to find out that the people of Elis had gladly sent to them a shoulder blade of Pelops. As for the Palladium, Odysseus and Diomedes, under the cover of the night, slipped into Troy and stole the statue, carrying it to the Greek camp. As soon as Philoctetes was cured from his wound, he managed to kill Paris, using the bow and arrows of Hercules. 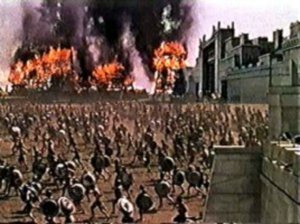 Despite, however, of some victories on the battlefield that quickly ensued as soon as the prerequisites stipulated by Helenus were fulfilled, the walls of Troy seemed impregnable, driving the Greeks into despair. As a last resort, Odysseus came up with an ingenious plan to get inside the city: With Athena's help, Epeius, an artisan, constructed an enormous wooden horse, which was hollow inside. 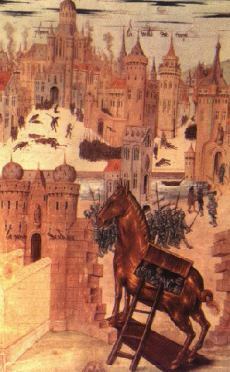 Led by Odysseus, a small army of Greek soldiers hid inside the horse while the rest of the Greek fleet sailed away, as far as the island of Tenedos. When the Trojans found the horse, which bore an inscription which said that it was a gift dedicated to Athena, they had a big debate about what to do with it. While some argued that it was a part of a Greek ploy and therefore they should push it over a cliff or burn it, others contended that they should bring it inside the city to replace their stolen Palladium, convinced that it would bring them luck. When the two prophets Cassandra and Laocoon explicitly tried to warn their fellow Trojans that Greeks were actually hidden inside the horse, no one believed them! 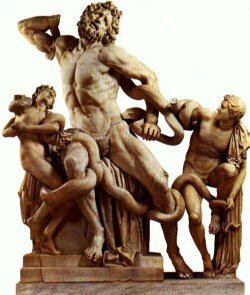 When Laocoon, in an effort to prove his claim, hurled his spear against the horse, two enormous serpents rose out of the sea and attacked the seer's sons. After a tremendous struggle, the beasts finally killed the two boys and Laocoon, who rushed to their defence. The Trojans interpreted this horrible tragedy as a punishment that goddess Athena sent to their priest, because he tried to desecrate her divine gift to the city. Even those who doubted the good intentions of the Greeks were finally convinced to take the horse inside the city, when somewhere outside the walls they met Sinon, a Greek soldier who was tied and his clothes were torn to shreds. 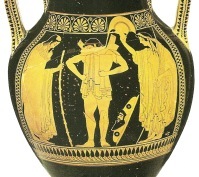 According to his story, which apparently was ingeniously devised by cunning Odysseus, he had escaped from the Greeks when they wanted to sacrifice him to appease Athena, who was enraged when her palladium was stolen. Furthemore, Sinon claimed that the wooden horse was constructed as an additional gesture to appease the goddess. As a matter of fact, it was designed to be so enormous, so that it would not fit to get inside the walls: The Greeks knew that placing the horse inside the city, would certainly bring victory to the Trojans! Harming the horse, Sinon warned, would turn the wrath of Athena against the Trojans. After the final shred of doubt was lifted, the Trojans breached their mighty walls and took the wooden horse inside, overjoyed by their victory over the Greeks. When all of them fell drunken asleep following a wild celebration, Sinon quickly released the Greek soldiers from the inside of the horse and using a beacon, signaled to the Greek fleet to approach Troy. Those inside opened the wall gates and the Greeks, without facing hardly any resistance, overtook the city in a single bloody night. This signaled the end of the Trojan War. 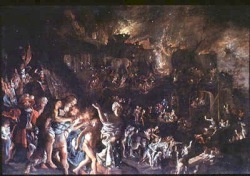 Ajax of Locris raped Cassandra at the shrine of Athena. This sacrilegous act offended even Odysseus, who called on the Greeks to stone Ajax, in order to appease the goddess. But the Greeks did not dare, as Ajax clung to the statue of the goddess. Odysseus threw Astyanax, the infant son of Hector, from the walls of the city to his death, thus ending the line of king Priam. As for Helen, the culprit for the outbreak of the Trojan War, Menelaus could not bring himself to kill her as he had vowed to do, unable to resist her beauty and her pleas to be saved. The long Trojan War cost both sides dearly. 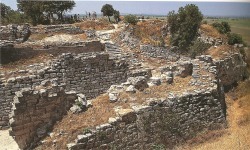 As for Troy, the city never managed to recover after the total destruction it had suffered. As for Greece, of the more than 1,000 ships which originally left for Troy 10 years earlier, less than 100 embarked on the journey to return home. Even most of these, were lost during the journey. Both Diomedes and Idomeneus, king of Crete, returned home only to discover that their wives had taken lovers. They were finally exiled from their homeland, seeking refuge in Italy. The king who was destined to suffer the most tragic death, was Agamemnon, the leader of the Greek army in the Trojan War campaign. 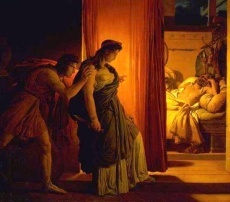 When he returned, his wife Clytemnestra, who considered him to be responsible for the loss of her beloved daughter Iphigenia, conspired with her lover Aegisthus to slaughter Agamemnon with an axe, the first day that he arrived back home. The saga of Agamemnon is figured prominently in the works of the great Greek playwrights. Three surviving plays by Aeschylus - Agamemnon, The Libation Bearers and The Eumenides - are collectively known as Oresteia. In addition, four plays by Eurypides - Iphigenia in Aulis, Orestes, Electra and Iphigenia in Tauris - as well as Electra by Sophocles, focus on the children of Agamemnon.